Arthas is an incredibly strong Warrior that has high amounts of crowd control and self sustain. He's capable of rooting players, slowing them and can self heal. He's also pretty tanky thanks to a variety of talents that provide shielding. With the current meta, Arthas is also in high demand. His ability to combine his Howling Blast with Frozen Tempest for a formidable chain spike that compliments any team. If you happen to have Kael, Li Ming or any burst mage in your party, the opposition are almost guaranteed to die to the abundance of roots and slows. Almost any team can make invaluable use of this window (during or fight or whether your enemy is fleeing) and more often than not, come out on top. The one downside to Arthas is that he's relatively mana intensive and he has no reliable escapes. As such, he relies on Howling Blast to flee but it may often be on cooldown. Correct positioning, not over extending too much and keeping a careful eye on your mana is key to staying alive. His Heroic (Army of the Dead) offers incredible survivability A weak solo Warrior when Army of the Dead is on cooldown. Frostmourne Hungers (Trait) - Frostmourne Hungers is your innate ability and it allows you to use your next basic attack instantly for double damage. Best of all, it'll restore 30 mana. It's pretty much a means of spiking opponents quickly and as you level up, it becomes even more potent with the opportunity to slow and to strike twice. One thing I would advise is to always, always use this ability. It should rarely, if ever, be off cooldown. Its mana return is great for halving the cost of Howling Blast/Death Coil and against squishy targets, you'll be able to double stike (Frostmourne Hungers > Basic Attack) for high damage. 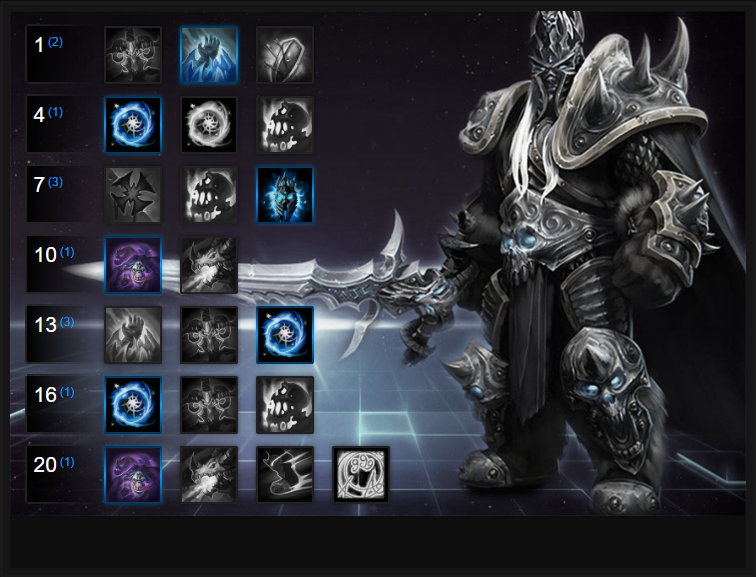 Arthas' abilities primarily revolve around keeping enemies close to him. His primary rotation is Death Coil > Howling Blast > Frozen Tempest > Frostmourne Hungers. It's a considerable spike that will pressure any opponent, however, it should be noted that if you're likely to need healing, you should save Death Coil for yourself. Death Coil (Q) - is a dual utility skill that allows Arthas to deal some ranged damage to foes or to cast it on himself for a heal. It doesn't heal for an enormous amount but it's enough to allow you some self sustain and to remain in lane longer. Used offensively, it's a good ability for finishing foes who are running away or just to poke. As it stands, it's best used on yourself when talented. Howing Blast (W) - Your primary offensive ability when it comes too coordinating team spikes or pressuring someone in your lane, Howling Blast will root a player at its final casting point. Based on this, you have to predict where someone will move to and ensure that they walk into the tip of the Howling Blast if you want to root them. Later game and once you've completed your quest, you'll be able to root anyone who crosses its path. Landing Howling Blast is fairly easy right now simply because the AOE for the telegraph is so large. Frozen Tempest (E) - This ability should only really be used briefly and predominantly when you're in a fight next to a group of Heroes. It'll drain your mana over time but slow and lower the attack speed of those affected by it. Against enemy minions it deals a fair amount of damage and allows you to clear lanes quickly. If you use Howling Blast, approach the enemy Hero and use Frozen Tempest, you'll be able to keep them next to you for a prolonged period and at the very least, force them to use a movement skill to escape. Summon Sindragosa (R) - Summon Sindragosa deals damage to all enemies in its path, slows them and freezes minions and structures. At later levels it can freeze enemy Heroes and its width and range make it hard to miss with. During a team fight, you should factor in that Sindragosa takes a couple of seconds to cast and you should attempt to aim where you expect enemy players will move to. If you land the hit, follow up quickly with a Howling Blast and Frozen Tempest to keep the pressure on. Be aware that Sindragosa has a brief cast time. Army of the Dead (R) - Providing Arthas with plenty of sustain during any team fight, Army of the Dead is an amazing Heroic. If you've a good healer, you don't neccesarily need the healing and its cooldown is pretty hefty at 80 seconds. Despite that, the Ghouls provide amazing amounts of sustain and can also body block incoming abilities. Arthas with all his Ghouls active is incredibly tough to bring down, especially if he also has his Death Coil off cooldown. Arthas is all about keeping enemies encased in ice, so taking Frost Presence allows him to drastically improve his Howling Blast. It's a multi-stage quest that has three stages. At 5, 10 and 20 heroes rooted your Howling Blast is significantly improved, allowing you to lower its cooldown, increase its range and root those who cross its path (respectively). Frozen Wastes is also a lengthy quest chain that significantly boosts your Frozen Tempest. All you have to do is stack against enemy players, with Frozen Tempest active, 150 times. The end result is a lingering movement speed and attack speed reduction after enemies have left your radius. It's invaluable for ensuring your debuff remains active on players even if they try to run. Allowing Arthas to gain +25 Armor instantly, reducing the damage he takes by 25%, Icebound Fortitude also reduces the duration of crowd control against him by 75% for 3 seconds. It makes Arthas an unstoppable juggernaut. Arthas needs to be in the thick of things to be useful so taking Army of the Dead to gain some much needed healing makes him particularly difficult to kill. Not only can he trigger the Ghouls to gain health, but he also still has his Death Coil and any support hero that's with him. Biting Cold further improves Frozen Tempest so that it deals an additional 12.5% damage every time an enemy is damaged, up to a maximum of 50% extra. It's a significant amount of AOE pressure to anyone and when combined with the movement and attack speed slow, few people can take on Arthas 1 on 1. Remorseless Winter allows Arthas to root enemies inside his Frozen Tempest. Although it can only trigger once every 10 seconds, it affords Arthas an amazing AOE lock-down. Variable: Building further on your Death Coil, Embrace Death allows you to deal additional damage based on how little health you have left. The maximum amount is up to 100% bonus damage and healing (based on your missing health) allowing you to heal for a significant amount if used when low. Allowing your Army of the Dead to heal for 50% more health per Ghoul, Legion of Northrend also creates 3 additional Ghouls, allowing Arthas to survive for ridiculous periods of time. Variable: Almost every composition in Hero League contains one or more magic users. Taking Anti-Magic Shell allows you to mitigate 100% of all incoming ability damage for 3 seconds and heal yourself for 25% of the damage received. It's ridiculously good. This list of tips and tricks are just a handful of things we think will help your Arthas play. We'll continue to add to the list as required and if you have any tips you'd like to share, let us know in the comments below and we'll place them here. 1. You can use Death Coil to heal yourself instead of on an enemy, which is amazing at allowing you to survive for much longer. 2. Using Death Coil > Howling Blast > Frozen Tempest > Frostmourne Hungers is an amazing spike on any Hero. 3. Always aim Howling Blast just infront/behind a player to take attack for its cast time and the opposition moving. 4. Frozen Tempest is great for clearing lane as it deals AOE damage. Be sure to turn it off as soon as enemies are dead. 5. If fighting Heroes, only turn on Frozen Tempest when they're near you otherwise you'll waste mana and achieve nothing. 7. With the exception of turning around to use Howling Blast as you run away, Arthas has no reliable means of escaping easily. Don't over extend and always have an exit plan. 8. Be sure to save Anti-Magic Shell for team fights, rather than 1 on 1 situations. It will allow you to sustain yourself for much longer. 9. Don't use Death Coil unless relatively low on health and if you do need a boost of healing, use it on yourself. 10. It's a good idea to roam as Arthas during early game as your Howling Blast can easily root a player and gaurentee a kill. 11. When a player is rooted by Howling Blast, always run next to them and start Frozen Tempest so they're slowed and take damage.